Why advertise on Facebook in Nigeria? Everybody knows how profitable it can be to advertise on Facebook. We have heard stories of how people have made lots of money merely by advertising on Facebook. Facebook advertising for Nigerians is the best because it is cheap and can get you instant measurable results fast unlike newspaper and TV which are relatively expensive and without a means of measuring the performance. The challenge most Nigerians face is how to pay for the Facebook adverts using naira here in Nigeria. This is because, Facebook only accepts credit cards when you want to pay to advertise. Another challenge is that creating and configuring the advert is a complex process and an inexperienced person can easily lose a lot of money if they attempt to do it by themselves. The good news is that there is a company that most people are now using in Nigeria that can help you place your adverts on Facebook while you pay or transfer into their Nigerian Bank account. What I like most about these guys is that they are very experienced and can help you get the best out of your adverts. Once you have paid, send the email and text according to the samples they provide and your advert will start running on Facebook not more than 4 days after you send them the text. We have used this company several times and are very satisfied with their services and will continue to use them because we have tried many others but these guys are better by far. Click here to learn more on how to pay in Naira for Facebook through this company. Where will the adverts be displayed on Facebook? 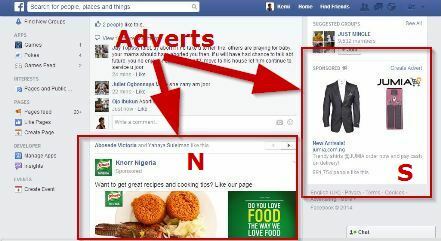 Click here for more tips and prices on how to pay in Naira for Facebook ads in Nigeria . The easiest way to drive traffic is to pay for Google or Facebook ads (if you can afford it). The easiest way is not the cheapest and the cheapest ways are not the quickest. Amazon pays directly here through foreign cheques that you can cash with a domiciliary account. It does not cost anything to get AdSense. Please sir i bought your ebook two years ago but cant remember the particular date. My problem now is i cant find the mail which you send to me that contained the link to how i can read the books in the library and the link to the special training forum.. I had problem with my gmail.. Which the link was sent to. Is unfortunate i didn’t put it down some where/remember it. But i know the link to the underground library and my password.. Please how do i get it back.